This is a knock ’em down, drop dead DOOZY. Tell your spouse, GF, BF, significant other…that you will need the day off to recover. This is undoubtedly one of the toughest heroes and a favourite in the CrossFit Community. There are a number of active restorative modalities that need to be employed by lifters to maximize restoration and training capacity. Accessibility will vary among lifters, but efforts will need to be made to do as much as is possible financially and with the time available. Lifters ideally alternate among available modalities to avoid any potential accommodation and consequent reduction in efficacy. Generally, more restorative work should be performed on rest days than on training days, and in the case of multiple daily training sessions, less intense modalities employed after early sessions and more intense modalities after the last session. Less intense modalities include stretching, napping, swimming and local cryotherapy; more intense modalities include massage, hydrotherapy (including cold plunge and hot tub), and dry and steam saunas. Just about everything that follows is attached to some degree of contention (sleep is probably the only restorative modality that attracts no argument). Research is limited and often dubious at best, so the bulk of recommendation is based on the experiences of athletes. If you have some research that you believe contraindicates any of these things, feel free to avoid them. Personally, I’m far more interested in the experiences of athletes and coaches than research in this area. In any case, you can argue either side on most of these things fairly convincingly, so it seems like a waste of time until you’ve experimented yourself and seen the results. I look forward to the vitriol on Facebook. This is arguably the most effective restorative modality available. Clinical research is somewhat ambiguous, and although some studies have shown significant improvements in recovery of strength and reduction of DOMS, results in the real world vary among athletes. Most support of this modality is anecdotal, but athletes with experience using it typically are adamant about its effectiveness. The contrasting temperatures improves circulation for improved blood and nutrient turnover in addition to the normal results of each, such as anti-inflammation and loosening and relaxing muscles and joints. Not all athletes have regular access to hot tubs and cold plunges. If these are available, this modality can be used 3-5 days per week. If access to alternative modalities of similar intensity and nature like saunas to allow variation does not exist, contrast hydrotherapy can be employed as many days of the week as allowable by access. 5-10 minutes of hot alternated with 2-3 minutes of cold is a reasonable protocol. If significant soreness or joint pain is present, starting and ending in cold is recommended; if stiffness or tightness is the chief complaint, the athlete can start and end in heat. Cold plunges, or ice baths, are also very effective, at least anecdotally. Water temperature should be between 50-60 degrees F (10-15 degrees C). A bathtub filled to be just high enough to cover the athlete’s legs will need about 20-40 lbs of ice. This plunge can be 10-15 minutes. Cold plunges are best after very heavy training sessions during particularly tough periods of training when athletes tend to be achy and inflamed. Again, research is limited and anecdotal evidence is all over the map, but cold plunges may increase testosterone levels, at least in men. Time in a hot tub can be a helpful way to keep muscles and joints loose and prevent stiffness from tough training. Hot tubs can also relax athletes in the evening and encourage better sleep as long as there is adequate time for body temperature to drop to comfortable levels before bedtime (the gradual reduction in body temperature itself is sleep-inducing to some degree). 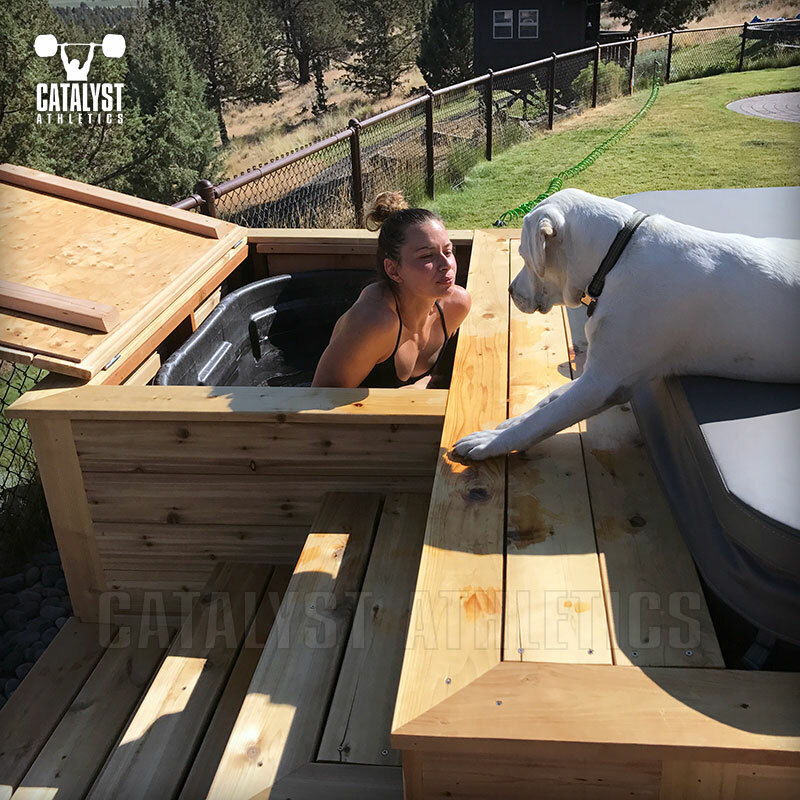 Typically in weightlifting, dry saunas are used primarily for cutting weight for competition, but they can also be used for restoration. For this use, it’s important athletes stay hydrated while using the sauna. Ideally, sauna time is alternated with cold plunges or cold showers to induce effects similar to contrast hydrotherapy. Time in a sauna also appears to have positive effects on growth hormone. Massage is a very effective restorative modality, but for most weightlifters is prohibitively expensive. However, even infrequent massage is better than none, although regularity even with infrequency will improve its effectiveness. Massage 1-3 times per week is ideal, but once monthly is still far better than never. Aggressive deep tissue work, except localized for a specific problem area to prevent injury, should be avoided within a week of an upcoming competition, as it can make the athlete feel slow and sluggish. Stretching and foam rolling, even for already flexible athletes, will help keep muscles moving fluidly and reduce joint pain. It can reduce stiffness that accumulates between training sessions, making warming-up easier and training better. Passive stretching can also be helpful for recovery and preparation for future training sessions by preventing or reducing soreness (Zatsiorsky 1995). Aside from the straightforward mechanical benefits to stretching and foam rolling, the practice can also serve as a calming, relaxing activity for athletes with benefits along the lines of napping or meditating, albeit to a lesser degree. Gentle passive stretching before bedtime can be helpful to settle the athlete down to prepare for sleep. Light, easy swimming and treading water can be restorative through the anti-inflammatory response to the cool water, the decompression of the spine, and the ability of muscles and joints to move without the pull of gravity they typically have to work against. Keep in mind that this is not exercise—this is gentle swimming that elevates the heart rate minimally over baseline. As discussed with regard to stress management, napping—including no actual sleep, but simply lying with the eyes closed in a quiet, dark room—is incredibly beneficial both physically and mentally for restoration. It should be a goal for all weightlifters to schedule a nap of at least 20-30 minutes each afternoon. This is even more important for lifters training in multiple daily sessions. Cryotherapy, or icing, of locations of acute pain or chronic low-grade pain can both improve training and help prevent minor acute or chronic conditions from becoming more severe injuries when properly implemented. Cryotherapy is a contentious subject even among medical professionals, and recommendations vary considerably. A pretty reliable guideline if you’re concerned about icing is to use ice when the problem area is muscle, and not when it’s connective tissue. In general, static icing should never exceed 10-15 minutes in duration no more frequently than hourly. Ice massage of a local area will only require 2-5 minutes, and can be punctuated on the minute with cross-friction massage. There are quite a few interesting things out there, and every day someone comes up with a new tool or protocol. Some turn out to be great, many turn out to be silly. Examples are vibrating foam rollers or using an electric car buffer to self-massage, acupressure mats, self-administered cupping or Graston, aromatherapy, and the like. By all means, try every single one of these, because you won’t know if they’re effective until you do, and if it’s effective for you, who cares what anyone else thinks of it? If you’re embarrassed, just keep it off Instagram and no one will be the wiser.